Biodegradation is the disintegration of materials by bacteria, fungi, or other biological means. Although often conflated, biodegradable is distinct in meaning from compostable. While biodegradable simply means to be consumed by microorganisms, "compostable" makes the specific demand that the object break down under composting conditions. The term is often used in relation to ecology, waste management, biomedicine, and the natural environment (bioremediation) and is now commonly associated with environmentally friendly products that are capable of decomposing back into natural elements. Organic material can be degraded aerobically with oxygen, or anaerobically, without oxygen. Biosurfactant, an extracellular surfactant secreted by microorganisms, enhances the biodegradation process. Biodegradable matter is generally organic material that serves as a nutrient for microorganisms. Microorganisms are so numerous and diverse that, a huge range of compounds are biodegraded, including hydrocarbons (e.g. oil), polychlorinated biphenyls (PCBs), polyaromatic hydrocarbons (PAHs), pharmaceutical substances. Decomposition of biodegradable substances may include both biological and abiotic steps. In practice, almost all chemical compounds and materials are subject to biodegradation, the key is the relative rates of such processes - minutes, days, years, centuries... A number of factors determine the degradation rate of organic compounds. Salient factors include light, water and oxygen. Temperature is also important because chemical reactions proceed more quickly at higher temperatures. The degradation rate of many organic compounds is limited by their bioavailability. Compounds must be released into solution before organisms can degrade them. Biodegradability can be measured in a number of ways. Respirometry tests can be used for aerobic microbes. First one places a solid waste sample in a container with microorganisms and soil, and then aerate the mixture. Over the course of several days, microorganisms digest the sample bit by bit and produce carbon dioxide – the resulting amount of CO2 serves as an indicator of degradation. Biodegradability can also be measured by anaerobic microbes and the amount of methane or alloy that they are able to produce. In formal scientific literature, the process is termed bio-remediation. In advanced societies, laundry detergents are based on linear alkylbenzenesulfonates. Branched alkybenzenesulfonates (below right), used in former times, were abandoned because they biodegrade too slowly. A branched dodecylbenzenesulfonate, which has been phased out in developed countries. Plastics biodegrade at highly variable rates. PVC-based plumbing is specifically selected for handing sewage because PVC biodegrades very slowly. Some packaging materials on the other hand are being developed that would degrade readily upon exposure to the environment. Illustrative synthetic polymers that are biodegrade quickly include polycaprolactone, others are polyesters and aromatic-aliphatic esters, due to their ester bonds being susceptible to attack by water. A prominent example is poly-3-hydroxybutyrate, the renewably derived polylactic acid, and the synthetic polycaprolactone. Others are the cellulose-based cellulose acetate and celluloid (cellulose nitrate). Under low oxygen conditions biodegradable plastics break down slower and with the production of methane, like other organic materials do. The breakdown process is accelerated in a dedicated compost heap. 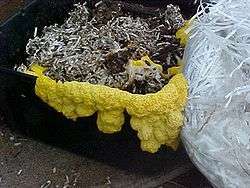 Starch-based plastics will degrade within two to four months in a home compost bin, while polylactic acid is largely undecomposed, requiring higher temperatures. Polycaprolactone and polycaprolactone-starch composites decompose slower, but the starch content accelerates decomposition by leaving behind a porous, high surface area polycaprolactone. Nevertheless, it takes many months. In 2016, a bacterium named Ideonella sakaiensis was found to biodegrade PET. Biodegradability, the conversion of >90% material material into CO2 and water by the action of micro-organisms within 6 months. Disintegrability, the fragmentation of 90% of the original mass to particles that then pass through a 2 mm sieve. Absence of toxic substances and other substances that impede composting. In 1973 it was proven for the first time that polyester degrades when disposed in bioactive material such as soil. Polyesters are water resistant and can be melted and shaped into sheets, bottles, and other products, making certain plastics now available as a biodegradable product. Following, Polyhydroxylalkanoates (PHAs) were produced directly from renewable resources by microbes. They are approximately 95% cellular bacteria and can be manipulated by genetic strategies. The composition and biodegradability of PHAs can be regulated by blending it with other natural polymers. In the 1980s the company ICI Zenecca commercialized PHAs under the name Biopol. It was used for the production of shampoo bottles and other cosmetic products. Consumer response was unusual. Consumers were willing to pay more for this product because it was natural and biodegradable, which had not occurred before. Now biodegradable technology is a highly developed market with applications in product packaging, production and medicine. Biodegradable technology is concerned with the manufacturing science of biodegradable materials. It imposes science-based mechanisms of plant genetics into the processes of today. Scientists and manufacturing corporations can help impact climate change by developing a use of plant genetics that would mimic some technologies. By looking to plants, such as biodegradable material harvested through photosynthesis, waste and toxins can be minimized. Oxo-biodegradable technology, which has further developed biodegradable plastics, has also emerged. Oxo-biodegradation is defined by CEN (the European Standards Organisation) as "degradation resulting from oxidative and cell-mediated phenomena, either simultaneously or successively." Whilst sometimes described as "oxo-fragmentable," and "oxo-degradable" this describes only the first or oxidative phase. These descriptions should not be used for material which degrades by the process of oxo-biodegradation defined by CEN, and the correct description is "oxo-biodegradable." The first known use of the word in biological text was in 1961 when employed to describe the breakdown of material into the base components of carbon, hydrogen, and oxygen by microorganisms. Now biodegradable is commonly associated with environmentally friendly products that are part of the earth's innate cycle and capable of decomposing back into natural elements. ↑ "Marine Debris Biodegradation Time Line". C-MORE, citing Mote Marine Laboratory, 1993. ↑ Kyrikou, Ioanna; Briassoulis, Demetres (12 Apr 2007). "Biodegradation of Agricultural Plastic Films: A Critical Review". Journal of Polymers and the Environment. SpringerLink . 15 (2): 125–150. doi:10.1007/s10924-007-0053-8. Retrieved 30 May 2015. ↑ "Microsoft Word - SECTION 6 BIODEGRADABILITY OF PACKAGING WASTE.doc" (PDF). Www3.imperial.ac.uk. Retrieved 2014-03-02. ↑ "Compostable.info". Compostable.info. Retrieved 2014-03-02.